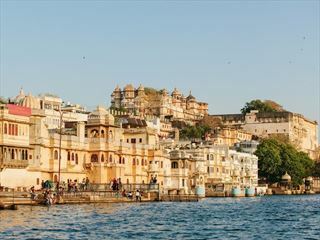 Discover the phenomenal highlights of North India on this 8-night guided adventure tour from Delhi to Varanasi. A wonderful introduction into the magical and enchanting land of India, you’ll explore some of the nation’s world-famous sights, including the Taj Mahal, Agra Fort and Palace of the Winds, and you’ll also have the chance to immerse in the rich, significant culture in the spiritual city of Varanasi. 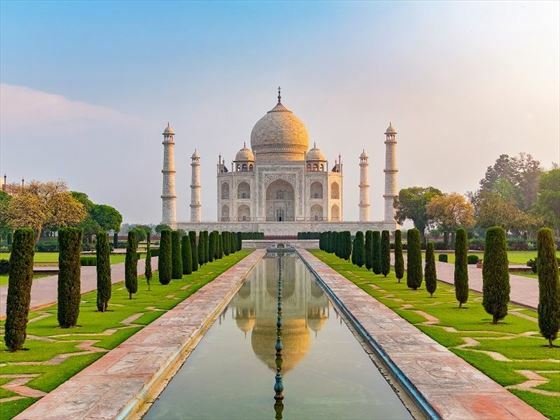 Discover lavish palaces, intricate temples, vibrant bazaars, Bollywood blockbusters and breath-taking cityscapes throughout this tour; packed with highlights, you’ll have ample time to discover the beating heart of India (INT). Welcome to India! Upon arrival in Delhi, take a complimentary airport transfer to your hotel. The adventure begins with a welcome meeting at 6pm, where you’ll meet your tour leader and fellow travellers. If you arrive early, be sure to spend some time exploring the exciting capital. Filled with historical sites and lots of fascinating museums and galleries, there’s so much to see and do here. After breakfast, your tour leader will take you to the city’s historic heart on a guided walking tour of Old Delhi. Set off on the modern metro system, and get a taste of India’s famed public transport with an optional rickshaw ride through the chaotic streets. Make a visit to the impressive Jama Masjid, Delhi’s oldest mosque, and then to the Sheeshganj Gurudwara to learn more about the Sikh religion. The rest of the day can be enjoyed at leisure; perhaps visit the World Heritage-Listed Humayun’s Tomb, built in 1570 as the first garden tomb in India, or gaze in awe at the tall brick minaret of Qutub Minar, or you could explore the mighty red fort of Delhi. Say farewell to Delhi’s hypnotising chaos this morning as you set off for Agra via train (2 hours), home to one of the world’s most recognisable monuments. 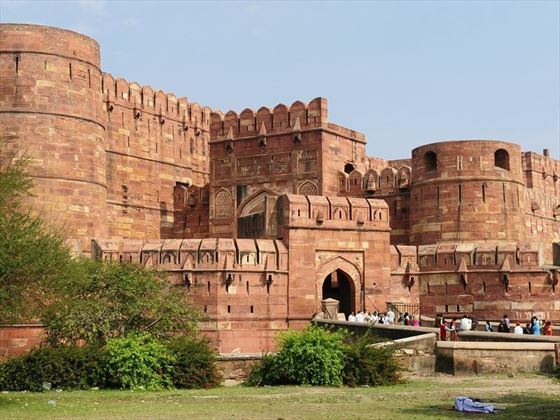 We think the best way to uncover Agra is by cycle rickshaw, so on arrival, you’ll be taken on a fantastic rickshaw tour of the city; visit the spectacular Taj Mahal, and spend some time soaking up the sights and exploring before heading to the Agra Fort – part fortress, part palace and part prison, the fort features magnificent throne rooms and tiny but intricately decorated mosques. The rest of the day is to spend as you please – we highly recommend a moving visit to the Sheroes Café, which employs women who have been affected by acid attacks. 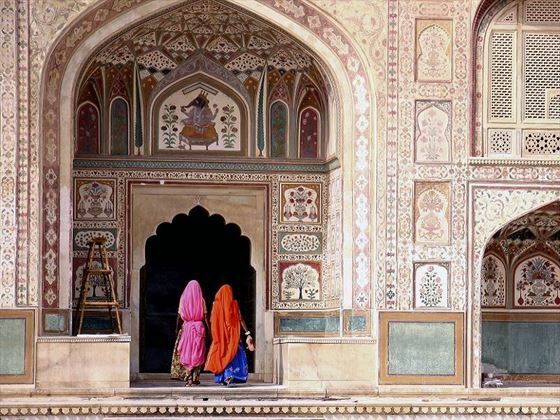 You’ll head to Jaipur, Rajasthan’s capital, via private vehicle today (taking around 6 hours). 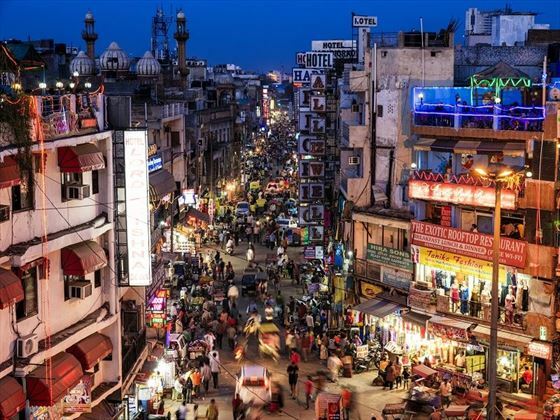 Get your first glimpse of the Pink City on a walking tour, where you’ll navigate the crowded streets overflowing with cars, camel carts, rickshaws, bicycles and trucks, while observing the city’s intricate and magnificent architecture. Visit a bazaar to browse handicraft textiles, art and local semi-precious stones, and make a stop at the Hawa Mahal, also known as ‘Palace of the Winds’, the second-most photographed building in India. You’ll then have the option of visiting Jantar Mantar, which is an observatory filled with instruments to track the stars. This evening, continue to indulge in the wonders of Indian culture by watching a Bollywood blockbuster Cinema – an elaborate combination of action, romance, drama and music at the spectacular Raj Mandir. Delight in an optional early-morning hot air balloon safari, offering breath-taking views over the Pink City bathed in the morning light. 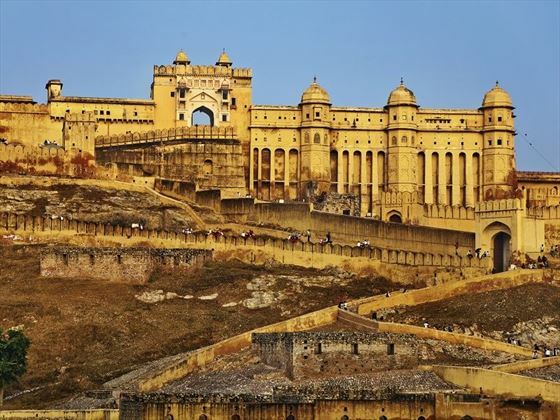 Later, climb the twisting roads of the Aravalli Hills to the massive Amber Fort – an opulent palace packed with elaborate rooms of lavish murals, frescoed arches and delicate jail work. Don’t miss the sparkling Mirror Palace, covered floor-to-ceiling in thousands of reflective tiles. 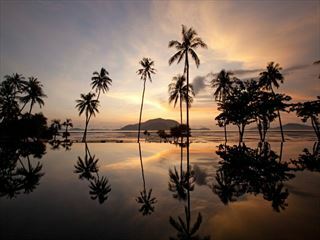 The rest of the day can be enjoyed at leisure. After a short flight from Jaipur, you’ll arrive in the holy centre of Varanasi this morning. 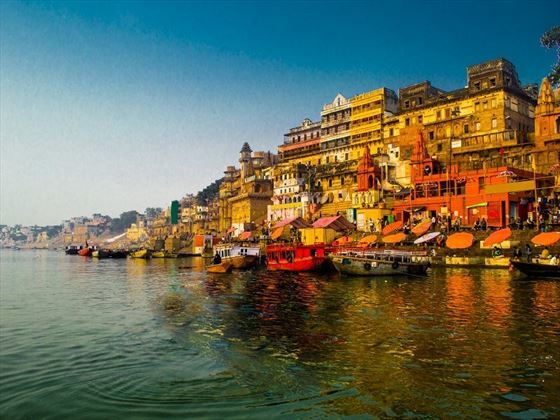 Awash with delicate shrines and temples, Varanasi is the ultimate destination for Hindu pilgrims who travel from far and wide to experience this spiritual city. Take a walking tour of the old city, winding through narrow lanes packed with stalls and shops, past the dhobi wallahs and the endless temples that exude the aromas of incense. Today will begin with an early sunrise boat ride on the Ganges, where you can watch the light gradually illuminate the many ghats and temples along the river. Then, there’s the option to take a trip to the nearby Sarnath, one of the four main Buddhist pilgrimage destinations. 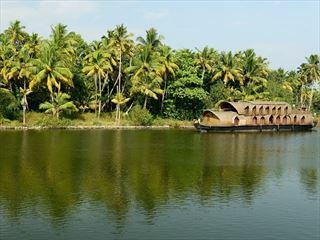 Alternatively, the day can be spend exploring the laneways and alleys behind the ghats, or picking up some examples of the excellent local silk industry. As your time in this sacred city comes to an end, perhaps witness pilgrims performing ancient bathing rituals and ceremonies. 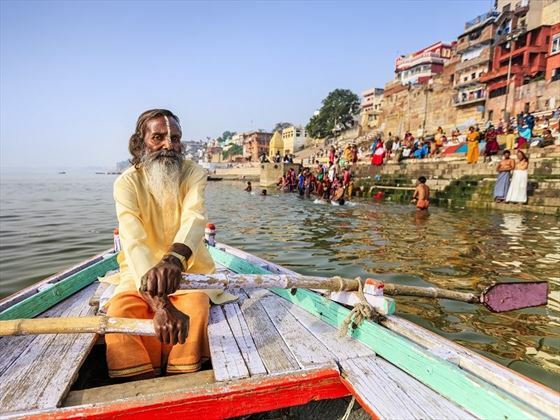 Use your morning at leisure to delve further into the spiritual atmosphere of Varanasi, wandering through the ghats and haggling with vendors in colourful bazaars. 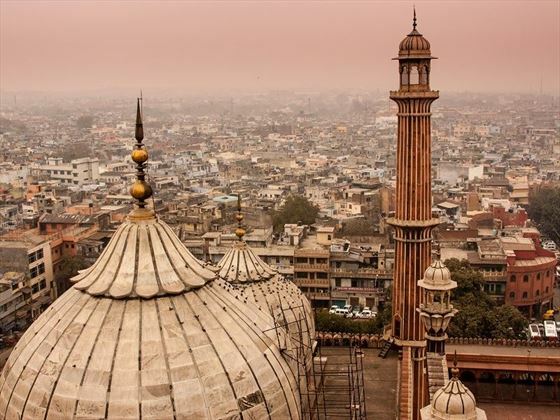 Return to Delhi by plane (around 1.5 hours), for a last chance to explore India’s capital. You could head to the legendary Connaught Place for some last-minute shopping. This evening, you could share your last dinner with your fellow travellers, reminiscing about the amazing adventures you’ve had. Your journey draws to an end after breakfast. There are no other activities planned for today, so you can depart from the accommodation at any time this morning. If you have some free time, Hauz Khaz Village is a great place to escape the hustle and bustle of downtown Delhi – a chic and artistic enclave set right next to the remnants of a historic site. Alternatively, you could pre-book an Urban Adventure to further explore Delhi with a local guide.